Lewis’s writing process was quite different from Tolkien’s. While Tolkien wrote things out in order to discover what he wanted to say, Lewis tended to mull things over before committing anything to paper. I have a similar attitude to books about C. S. Lewis and the Inklings. I’ve read several, but far from all of them, and I feel no obligation to. If someone writes a new book with fresh information, somebody is pretty likely to tell me about it, in a discussion group or in a review in the Bulletin of the New York C. S. Lewis Society. 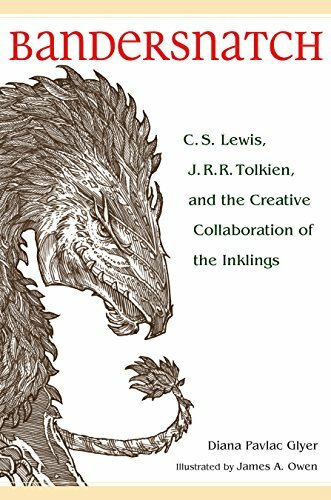 So I didn’t learn a lot of new things from Diana Pavlac Glyer’s Bandersnatch: C. S. Lewis, J. R. R. Tolkien, and the Creative Collaboration of the Inklings. But this book wasn’t really intended to convey biographical information (though it’s as good an introduction as any for the curious). Its purpose is to analyze the ways in which the Inklings group, which lasted 17 years (quite an achievement for any writers’ group) served as a catalyst for its members’ creativity. She follows the Inklings’ history from its beginning when Tolkien – very shyly and with trepidation – showed a poem to his new friend Jack, taking a chance that he’d be the kind of person who’d appreciate it. Jack Lewis did – with great enthusiasm – and gradually they gathered about them a small community of fellow writers of like mind. They read their work to each other and boldly critiqued it, in a cloud of tobacco smoke in Lewis’ shabby rooms at Magdalen College, Oxford (the famous Tuesday meetings at the Eagle and Child pub were purely social, and guests were permitted, which was not true of the Thursday nights at Magdalen. I was amused to read that Tolkien made the mistake of bringing along the historian Gwyn Jones [a famous name to Viking buffs] one evening, and it got a little awkward, though Jones proved acceptable). Author Glyer has done a tremendous job going carefully through old manuscripts and notes in various collections, looking for evidences of revision, and correlating them with reports of the Inklings meetings. It was a gargantuan task, and the result is a book that will be valuable to everyone interested in artistic mutual support groups – not just to writers, but to anyone who creates art. I recommend Bandersnatch.